Book One of the Milford-Haven Novels, based on the author's own hit BBC Radio Drama, introduces the beautiful coastal town and its several residents, including protagonist Miranda Jones. An ambitious young woman whose paintings are beginning to succeed in the competitive art world, she is also on an internal personal journey to establish her own sense of spirituality and purpose. Author Mara Purl is a former soap opera celebrity from Days of Our Lives, as well as a former journalist from the London Financial Times and the Associated Press. Through her novel series she has established a loyal following in the Women's Fiction genre. Short stories appear as prequels to each novel, extending the five-book series. What are the dynamics of Milford-Haven? What is nurturing and sup­portive about a small town? When should privacy take a back seat to "public good"? Do you feel you have an absolute right to privacy? Is Samantha in crisis? At what point have we encountered her in her life? Why does Samantha keep a journal? What function does journal writing perform in her life? Why do people keep journals? Have you ever kept a journal? What did it do for you? Is Chris careful or foolhardy? Does she place her job or her personal life first? Was her trip to the Clarke house impetuous or well-calculated? Should a journalist do almost anything to get at the truth? Would you agree Jack is a "head" person rather than a "heart" person? Do relationships make us more complete? Or do we first establish our completeness, then bring this quality to a relationship? Would you choose a life partner with your head, or with your heart? Do you believe Miranda "makes" things happen when she paints intu­itively? What makes an artist essentially different from other people? How do you explain synchronicity or coincidence in your life? What are Zelda's motives? Do you think she's benevolent or malevo­lent? Why is Cynthia so calculating at such a young age? Why do some women manipulate every personal and business relationship? Do you think there are times coercion is justified? Have you sometimes used it in your own personal or professional life? Is Miranda responding to a deep and soulful recognition when she meets Zack? Is she wise in pursuing a relationship with him, or is she treading on dangerous ground? How can you tell whether or not you've met the "right" person? As a former journalist who wrote for the Associated Press, The Finan­cial Times of London, Rolling Stone, the Christian Science Monitor, and the Mainichi Daily News, Mara Purl was trained to do extensive research and to report accurately. How might her journalistic background have influenced her as a novelist? 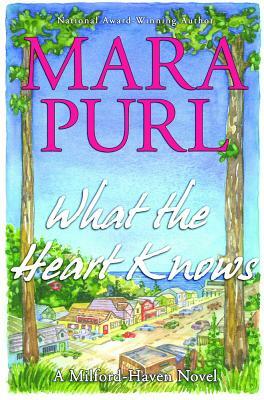 Why is this book called What The Heart Knows? Does this phrase apply only to Samantha and her journal writing? How might this apply to Miranda's meeting Zack? Does important information come to you through both head and heart?